Yesterday’s Computers – Tomorrow’s Antiques? I came across a news article the other day about an auction due to take place in Germany later this month (www.bbc.co.uk/news/technology-22510800). A number of the items to be auctioned are computers or computer-related, including three early microcomputers (a Scelbi-8H from 1974, a MITS Altair 8800 from 1975 and an Apple-1 from 1976) and one of Blaise Pascal’s beautiful ‘Pascaline’ mechanical calculating machines from the 17th century. All of these are very rare, especially the Pascaline, only 9 of which are known to have survived. Though not quite as rare, with 30 to 50 examples thought to exist, the Apple-1 is highly prized and the last one to appear at auction sold for an eye-watering $640,000, which is an incredible return on the original purchase price of $667. This set me thinking about computers as collectables. Is there a market for vintage computers in the same way as for vintage cars or antique furniture? And if there is, which computers would be the most collectable and why? When I started researching my book in 2003, I soon became aware of several web sites devoted to collections of early computers. The number of such sites has grown steadily over the years, evidence perhaps that there is a sizable community of computer collectors out there in cyberspace. Vintage computers do occasionally appear on Ebay but collecting them doesn’t seem to have gone mainstream yet, as there is certainly no sign of computers featuring in any of the many television programmes, magazines and books devoted to antiques and collectables. Thankfully, computers are becoming more common as museum exhibits and there are now several museums devoted exclusively to computer technology. Two excellent examples are the Computer History Museum in Mountain View, California, and the National Museum of Computing at Bletchley Park in the UK. There are also a number of projects aimed at restoring or conserving important early computers, the most famous of which is probably the Colossus Rebuild Project. In the UK, much of this activity is led by the Computer Conservation Society which was founded in 1989 to preserve historic computers, develop awareness of the history of computing and encourage research. Historic computers of national importance such as Colossus are clearly valuable and should be preserved for posterity. But what about the many thousands of different models of computer that were aimed at the commercial market. Are any of these worth collecting? Valuing such items will be difficult, as price guides don’t exist and the attributes used for valuing antiques, such as intrinsic value (i.e. the cost of the materials and manufacture), craftsmanship and decorative value, don’t really apply to computers. Fortunately, there are some which do apply, such as rarity, provenance and condition, so these would be a good starting point. Other factors to consider might include sentimental value, such as where someone wishes to obtain an example of their first computer. On the negative side, the physical size of a computer is likely to dampen its desirability, as few private collectors will have the space in their homes for a collection of room-sized mainframes or minicomputers. Whether the computer is in working order or not is an interesting one. Would a collector really want to operate an early computer and run software on it? I’d like to think that historical importance would be a major factor in determining the value of a vintage computer but this can be difficult to assess and there is often wide disagreement over which computer should have credit for a particular commercial or technological breakthrough. To illustrate this, try typing “first personal computer” into Google. It will be interesting to see which of the three early microcomputers being auctioned in Germany later this month fetches the highest price. In terms of historical importance, it should probably be the Scelbi-8H which was the first general-purpose microcomputer to reach the market. However, few people have heard of Scelbi whereas Apple products engender fierce loyalty amongst their many admirers so the Apple-1 is likely to win the day. So, which computers would be worth collecting? My money would be on iconic personal computers, such as the three early microcomputers featured in this month’s auction, or early portable computers such as the Osborne 1 from 1981 and the GRiD Compass 1100 from 1982. Mechanical calculators might also be a good bet due to their relative rarity. 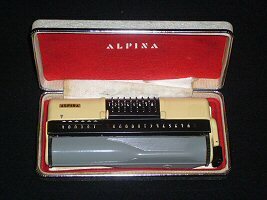 My personal favourite is the Alpina Universal Calculator from 1961. Manufactured in West Germany, the Alpina was in production for only a year. I’m fortunate to own one of these amazing little machines. Perhaps this could be the start of a collection! This entry was posted in Computers as Collectibles and tagged Antiques, Apple I, Collectibles, Pascaline on 19/05/2013 by Stephen J Marshall.